After a ridiculously long time (I think I started the teddy over a year ago), we're now releasing the updated version of the Big Teddy. I loved the original the pattern, and the toy is still around here somewhere, although a bit ragged from too many kid and kitty snuggles. However, it was long past due for an updated format, and some minor changes to the shaping. I've also altered the overalls: garter stitch borders instead of seed stitch, and the straps button to the bib so the overalls are easier to put on. I knit the toy from Lamb's Pride Bulky, in dark grey, and have about 10 g left. 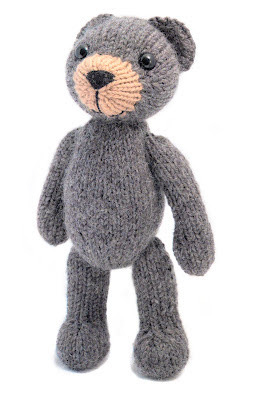 If you know you knit on the loose side, you might want to have a little more than 100 g for the toy, just in case (or use smaller needles). I used some beige worsted weight yarn held double to knit the nose. The overalls were knit with Knit Pick's Merino Bare worsted yarn that I dyed with food colouring. 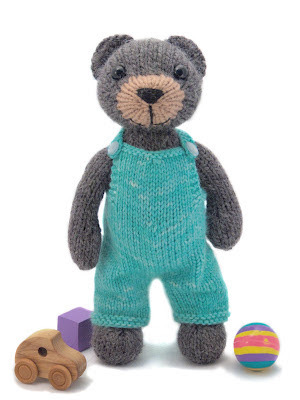 As always, if you've purchased the original pattern, you can have a free copy of the update. If you bought it on Ravelry, you've already been sent a download link. If you bought it elsewhere, please email me with a proof of purchase (Lulu or Etsy receipt, or just a copy of the old pattern). I don't get a lot of time to answer email, so I hope you can be patient. June 3, 2012 at 9:17 a.m.
June 8, 2012 at 3:52 p.m.
June 21, 2012 at 10:05 p.m. He's adorable - as they all are. Sorry I'm late - but I've been actually actively taking on some projects of my own, things I've needed to do for years. Now I have four of my books set up for Amazon - print and ebook. And it was harder than knitting is for me - which is going a ways. It's good, isn't it, to have actually done something - to strike it from the list? Only one of the books was a reprint - of one my award winning books. The other three were fresh. June 25, 2012 at 10:27 a.m.